Posted by Bill Mann on Tuesday, January 8th, 2013 at 7:51pm. 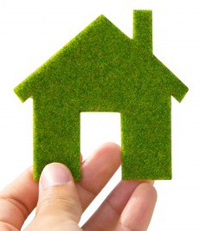 "Green" homes can be great for the environment and can save you money over time. For environmentally-conscious homeowners wanting to minimize their footprint and their energy bills, there are four areas upon which to focus. According to the Environmental Protection Agency (EPA), as of December 2012, buildings account for 68 percent of the nation's total energy consumption. Green homes can reduce this figure via energy-efficient appliances; well-sealed, double-glazed windows; and good insulation. Alternative energy sources such as solar panels can also reduce energy use. Building materials are determined to be "green" based on manufacturing, shipping, and reclamation procedures, and are composed of renewable resources. Reclaimed materials such as wood from an old barn; or recovered newspapers for use in insulation are often considered to be green. Counter-tops made from recycled materials are often considered green, too. Ceramic tiles, because of how much energy is required to form them, are often not considered green unless reclaimed from a demolition project. A home for which the main living areas are facing south will be warmed by the sun in winter, and will not be overheated by the sun in summer. This is considered "green", as is proper window placement which allows for cross-breezes which can lower energy costs on warmer days. Living in proximity to work and other frequented spots can reduce automotive energy consumption, too. Good air quality means promoting a safe, toxin-free environment. Using non-toxic paints in your home plus other green materials can improve air quality. Most notably because, over time, synthetic paints and materials break down, releasing harmful particles into the air. When buying a green home in Rehoboth Beach , be sure to ask questions of the seller including how the home was built, which materials were used in construction, and whether the home's appliances are Energy Star-rated.